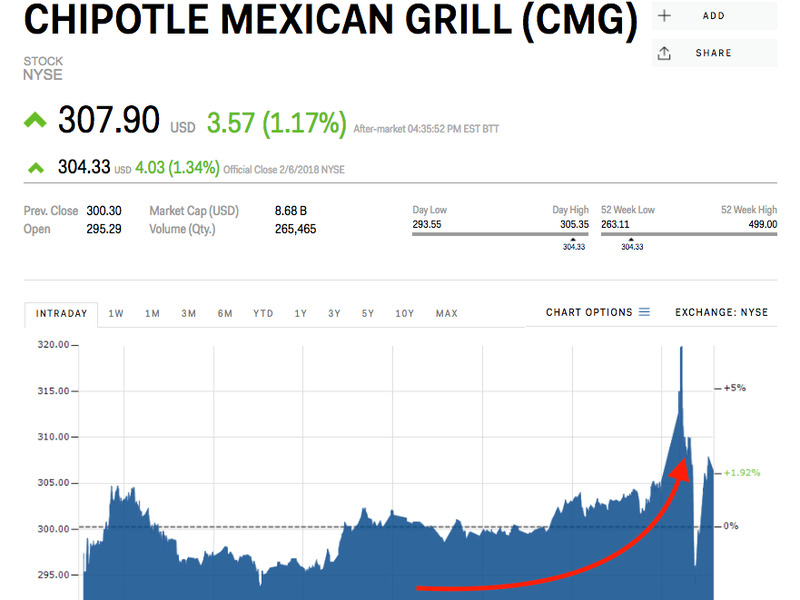 Chipotle beat Wall Street’s earnings expectations for the fourth quarter on Tuesday. The stock initially jumped more than 3% before settling up slightly in after-hours trading. Shares of Chipotle Mexican Grill spiked more than 3% after-hours Tuesday, settling up about 1%, following earnings from the fast-casual chain that beat Wall Street expectations. The company reported earnings of $US1.34 per share, just above the expected $US1.32, and matched expected revenues of $US1.11 billion, fuelled by menu price increases in most of its restaurants. Same store sales, an important metric for food companies, were up 0.9% in the quarter. Analysts had expected 0.8% growth. “During 2017, we have made considerable changes around leadership, operations, and long-term planning and it is clear that, while there is still work to be done, we are starting to see some success,” said CEO Steve Ells, who recently announced he will depart the troubled chain when a replacement is found, said in a press release. For 2018, Chipotle says it plans to open 130-150 new restaurants. The company also said it expects to save between $US40 and $US50 million thanks to the recently passed tax cuts, and plans to invest “more than one-third” of the savings into a cash bonus for staff, as well as expanded benefits.